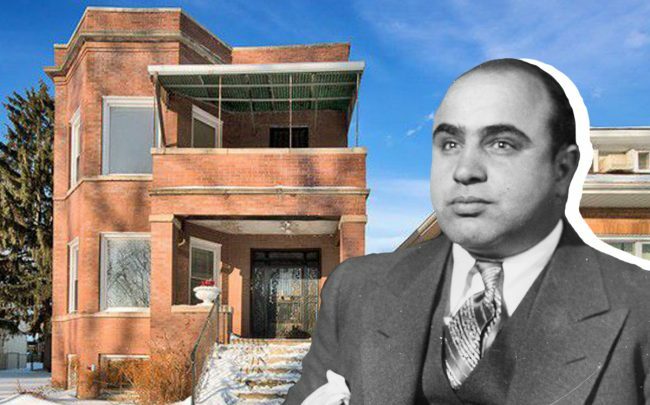 A South Side two-flat where gangster Al Capone lived after moving from New York sold for more than twice its asking price. The 2,800-square-foot building at 7244 South Prairie Avenue received some 80 offers after going on the market at nearly $110,000 earlier this year, and ended up selling last week for $226,000, according to the Chicago Tribune. Listing agent Ryan Smith of Re/Max Properties told the Tribune media coverage of the listing helped generate the intense buyer interest. Capone moved into the two-flat with his mother and sister in 1923 after moving to Chicago from New York. His wife, Mae, and mother, Teresa, signed the deed for the home, paying $5,500. Capone did not return to the home after getting out of prison in 1939, moving instead to Florida, where he lived until dying in 1947. The family owned the home until his mother died in the 1950s, according to the Tribune. The six-bedroom building, which was lost in foreclosure in 2018, sits on nearly three full standard Chicago lots. MTGLQ Investors, a distressed-property subsidiary of Goldman Sachs, bought it in November and listed it in February.